Vote for us and make us happy monkeys! The UK Festival Awards voting is now live, and it’s all decided by you, our legendary fans. We really really want one this year after narrowly missing out on Best Small Festival the last couple of years. Please join the thousands of people who have already placed their votes and go to the UK Festival Awards Facebook page to give 2000trees your all important vote! We seem to come second every year so if you could spare a couple of seconds to vote for us it would make all the difference and we’d love you forever and ever. And ever and ever. As thanks, if we win we’ll all run round the award ceremony naked*. And we also promise we won’t badger you again next year AND we’ll book all your favourite bands for next summer! So forget politics and those pesky politicians and vote for us instead. You know it makes sense! *nakedness depends on how many sambucas we’ve imbibed prior to the award ceremony. Well we’ve been busting our humps for exactly a year now and we are just about ready to get jiggy with you all in less than 2 days! We’ve been remarkably lucky with the weather for set up week as the photo below proves, but we won’t lie it is fairly moist here at Upcote farm. So you really do need to bring your wellies cos it’s gonna get muddy, but I’m sure we’ll all still have a massive giggle! We have millions of amazing bands, loads of awesome foodies and we just had 6,000 pints of badgers bottom delivered so we’re literally on it like a scotch bonnet! OPENING TIMES: – the doors open at 1pm on Thursday for Early Entry Ticket holders only. If you have a standard weekend ticket then you will not be allowed access until 8am Friday. Please DON’T turn up early – we will not let you in! BAND START TIMES: – bands start at 4pm on Thursday and midday on Friday & Saturday. ID: – If you look under 21 and want to be served alcohol at the bar then you must bring an official form of ID (passport, photo driver’s licence, Prove It card etc). FORBIDDEN ITEMS: – as a condition of our license you cannot bring glass, fireworks or chinese lanterns onto the site. DIRECTIONS: – click here for directions and transport information. BBQs & BONFIRES: – Small disposable BBQs are cool, but as a condition of our license bonfires are unfortunately not allowed. LITTER: – Upcote Farm has been designated an Environmentally Sensitive Area. Please put all litter in the bins provided and respect the local environment. Recycling facilities will be available so please please please use them. More info is available on our website here. And if anyone fancies a pre-Trees warm up, we’ll see you at the Your Demise gig in Cheltenham tonight. The beers are on you! Get Ready. Get set. Go. We’re very proud of our line up this year so please make sure you have a good listen in advance. Just go to the 2000trees line up page to find links to all the bands plus our awesome Spotify playlists. – Main Stage: something for all tastes. – The Cave: a much more alternative selection of rock dance-floor fillers. – The GreenHouse: a selection of dance DJs plus some seriously chilled out tunes. The Distribution Point will be located next to Wristband Exchange and will be open from 7am to 3am on Friday / Saturday and between 7am and 1pm on Sunday. Don’t forget your £10 deposit. There are three Busk Stops on site. For Busking! Get it? Just grab a guitar and get up and play anytime you feel like it. Or why not go all Futureheads on us and do it A capella? Bring your radios folks and tune in to Trees 87.7FM throughout the weekend to hear a selection of interviews, secret acoustic sets and much more. Gonna be sweeet! Showing you a little bit of what goes on at Upcote Farm when the field is not packed with you legends, the farmer, Sheila Platt, will display how she controls her sheep using only a whistle and her two dogs. Good clean fun! Weather permitting this will be taking place at a top secret location (one of the fields) so you’ll need to meet us at the GreenHouse at 10.45am on the Saturday. The theme is Video Game Characters – hopefully you already know this. To enter the competition you’ll need to register in Lebowski’s Bar (in the main arena) between 1pm and 3pm on Saturday. The winner will be announced at the Main Stage around 4:15pm. Excited yet?! We certainly are. With under 4 weeks to go till 2000trees numero 6 lands at the amazing Upcote Farm, we thought we’d let you know the last 5 bands and ask you to help us out with a fans-only 2000trees Spotify playlist. Read on for details on how you can submit your favourite tracks. We’re very very excited to announce that Stealing Sheep, Among Brothers, The People The Poet, James Levy and Lewis Floyd Henry are all climbing aboard the 2000trees train. Destination Festival town! Also, we thought it would be a cool idea for you to help us compile a Spotify playlist of your most anticipated Trees tunes. So simply go to our 2000trees Spotify playlist and add your 2 favourite tracks by searching for a band and dragging over your choices. 4) Listen and get excited! Simples. So if someone’s already added in 2 tracks for any given band, you’ll have to pick another band to add in. That way hopefully the whole of the line up will be represented and the playlist will literally be what 2000trees 2012 is going to sound like! Well that’s about all for now – we’ll be in touch with some final info in the next couple of weeks. Until then, keep all your fingers and toes crossed that the British Summer will come out to play soon! Hope you’re as excitabubble as we are!? Where do you camp at 2000trees? Hola – here at 2000trees we’ve had a long history with Xtra Mile Recordings & always love welcoming their bands to Upcote Farm. But did you know there are 3 Xtra Mile band inspired Camp/ stages/ hangouts at 2000trees? Give us a bit of your history! How did your camp for 2000 Trees come to be? What made you want to start a camp and name it after one of our XMrtists? Aidan of Camp Reuben: Back in 2007, Reuben were booked to headline the second ever 2000 Trees, and a group of us who inhabited the official forum (ie. band nerds, superfans, obsessives, fantatics, etc.) all bought tickets to come and see them play their first festival headline set. Sadly it wasn’t to be, and the band split up before the festival happened, but we all decided to come along anyway, camping under the moniker ‘Camp Reuben’ – we made a flag, we learned the songs on guitar, and we organised a big singalong for Reuben fans like us who’d missed out on the chance to see them there. We ended up with over a hundred people in our campsite, including Frank Turner, singing along until the early hours, and the night became a little legendary in 2000trees history. We loved it so much we’ve been back every year since, and a few years ago the lovely organisers (who by now we know quite well!) asked us to make it official, and gave us our own sign, stage, and pride of place on the festival map. Now when we arrive each year it feels like coming home! Hana of Camp Reuben: Without bragging, Camp Reuben was the first and was born very organically from a totally-not-creepy love of the band and an affiliation for acoustic guitar, singalongs and pillowcase flags. Much of the original camp group from that first time 9 years ago are still religiously in attendance, as well as picking up some loyal helpers and followers along the way and so we’ve just snowballed rather than fizzling out. Josh of Camp Turner: Well it all started when Frank was set to headline trees 2013 and a bunch of us in the Frank Turner Army (FTA) wanted to go but had nobody to go with. From there, a group was set up by our original leader Jake and it soon snowballed into a community. The name Camp Turner stemmed from the fact that a bunch of strangers on the internet were all coming together for their love of one artist. Elly and Nardia of Camp Turner: In 2013, 2000trees announced their lineup and a lot of Xtra Mile acts were playing, including Frank Turner. Lots of people started talking about how they wanted to go cos it was a great line up but they didn’t know anyone going. So we ended up getting together and starting a Facebook group to all organise going together. We were initially called 2000trees Army and then someone did some research into 2000trees, and there’s a camp there called Camp Reuben… The main draw for us that year was Frank, as he was billed as playing twice (but I think ended up playing about five times) so we named our camp after him and in reference to Camp Reuben who’ve been around a lot longer than us! Dan of Camp Marwood: I first attended 2000trees back in 2011 and have been every year since (apart from 2012. I couldn’t get the time off from my old job. Bastards!!). Seeing Ben Marwood play each year was always the highlight of my time at 2000trees. Every year, his crowd got bigger and the volume of people singing along got louder. You could see by the massive grin on his face each year that it was always appreciated and he took none of it for granted. At the end of 2014, when he first announced to the world that he had been having health issues, I was sad that he wouldn’t be at 2000trees in 2015 but having time off seems to have been just what he needed. I knew that there were going to be a lot of people missing him and his songs, and that’s where the idea for Camp Marwood came to be. I thought that it would be cool if I could get a bunch of people to play some songs and throw in a Ben Marwood cover or two one night at 2000trees. Where can people find your camp at 2000trees? Hana of Camp Reuben: We’re in the camp site nearest to the main arena, because years ago it was the only one there! We’re now up in the top corner where oldies will remember the old Greenhouse Stage being, so just follow through the stalls to the arena and look out for our Red and Yellow Stripy Home! You can’t miss it! Josh of Camp Turner: Usually slap bang in the middle of the camping area, but we’re also on the map, have a giant sign and if all else fails I always dress in a blue morphsuit for the first day so people can find a friendly face easier! Dan of Camp Marwood: People can find us at The Roundabout Busking Stage on the Friday & Saturday night, after the headliners on the main stage have finished. What’s the atmosphere of your camp like? Party-hard? Calm? Bit of both? Something else? Hana of Camp Reuben: Oh well we’re all getting older now, and while we still like a bit of a party we’ve also introduced morning sessions to great success! At that time in the morning when we’re all feeling a little bit delicate from the cider influx it’s absolutely wonderful to kick back and let the dulcet tones of The Cadbury Sisters wash over your sorry bones… having said that, the Reuben singalong is still utterly ridiculous after the bands have finished on the Thursday and has followed absolutely KILLER sets by Andrew Groves of Arcane Roots for the last two years (seriously check us out on Youtube!). We’re just a bunch of mates flying the flag for Reuben and celebrating all music from morning ’til night. Josh of Camp Turner: We’re a mixed bunch but there’s something for everyone. We’ve got a stage that throughout the night always has artists jumping in when the main stages close. But we’ve also got members who like their sleep. Luckily the stage is in the public walkway bit so if you want a good quiet sleep you can pitch your tent in the quiet end of the camp. Elly and Nardia of Camp Turner: It’s pretty relaxed, we spend most of the day sitting around our camp hungover, then all head off to see our favourite artists play on various stages. Then, after the music, that’s when it really comes alive! The festival have kindly supplied us with a small stage, and some of the acts who are staying for the whole weekend are kind enough to come and perform a small unplugged set. It’s a lot of fun and some of our best 2000trees memories are from those sets. Dan of Camp Marwood: As last year was our first year, it became a real party. My friend Neil Morris (who helped organise the camp) had a box of strawberry daiquiri and we ended up getting quite…merry, shall we say. We took turns introducing each act and each time we went up there, our ability to form any kind of coherent sentence became pretty much non-existent. Neil actually took off and went to bed early because he said, and I quote; “I’m going to go now because I think I’m offending people”. Amazing. I’m sure this year will be no different. What are your camp traditions, or what are activities you try to have each year? Hana of Camp Reuben: We always have a singalong. We encourage open mic style performances and we usually ask each band/act playing if they could squeeze a cheeky Reuben cover out for us. Well, we’re there for a reason! Josh of Camp Turner: Outside of booking whoever we can to play sets for us at night and yelling Slayer requests at them, we have suave Saturday where people dress as smart as they can. It’s a classy affair that coincides with our awards night. You can earn an award for pretty much anything memorable so it’s always a laugh. Elly and Nardia of Camp Turner: We always decorate the camp with bunting and flags, but so far every year has been different at Trees, so it’s hard to say what’s sticking forever. One thing you can guarantee though is that they’ll always be someone around camp with a guitar for singalongs. Dan of Camp Marwood: The tradition is to try get as many people to play as many different Ben Marwood songs as we can and have a bloody good time doing so. What makes you keep going back to 2000 Trees, even for the years when your camps’ namesake is not playing? Aidan of Camp Reuben: Honestly, the vibe of the festival is unparalleled – the sheer amount of great new music and friendly faces means that a lot of other festivals, especially the big corporate ones, seem a bit rubbish in comparison now. 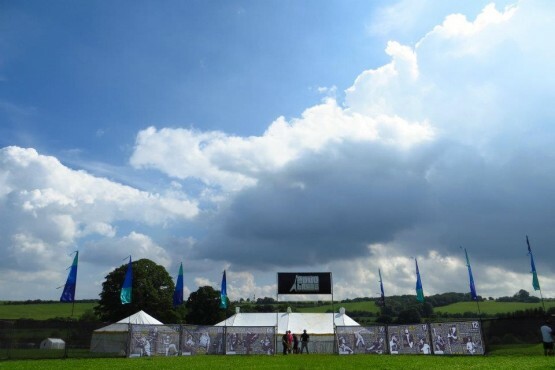 Of course we’re a little bit biased, but it seems to be a common theme – even meeting people in the last few years attending for the first time (now that the festival is a fair bit bigger than it was back in its infancy) it’s noticeable how many people comment on just how different it feels to a lot of other festivals. I think a lot of that is down to the size – I think they hit 5000 capacity a few years ago and have kept it at that size ever since, so it doesn’t feel like it’s ballooning into some giant event, it still feels like a good-sized community of people. Hana of Camp Reuben: Oh man, way to rub it in! Our namesake has never played! We’re so lucky though because we get Jamie Lenman AGAIN this year, and in the past we’ve had Guy Davis come for a cup of tea (we hid our Reuben shower curtain ‘cause we were embarrassed…!). We’re all sorted for Reuben love from the amazing people who come to us every year, and with the music that the Trees crew book. Lucky really! Elly and Nardia of Camp Turner: Frank hasn’t played 2000trees since the first year of Camp Turner, but the friendships and the atmosphere of the festival keep us coming back every year, regardless of the line up. Dan of Camp Marwood: I keep going back because the small group of friends that I go with are such a great bunch of guys. We aren’t really the kind of people to go away on massive lads holidays or anything like that so Trees is like our holiday. Three days in a field in Cheltenham surrounded by likeminded people with the best possible music playing. Oh, and white Russians (the alcholic beverage, though sure, there may be some Russians too – XMR). What more could you want? What are you most looking forward to for 2000trees 2016, music or otherwise? Josh of Camp Turner: I’m looking forward to seeing the Smith Street Band, The Computers, Crazy Arm and Max Raptor. Non-music related though I’m looking forward to making more memories at Camp Turner. Elly and Nardia of Camp Turner: We’re obviously very excited for the Xtra Mile take over on the Thursday, but mostly we’re just excited to be back in our favourite fields with our friends! Dan of Camp Marwood: I’m very much looking forward to seeing the return of Ben Marwood! Also I can’t wait to experience Animals As Leaders. I’m a huge fan of that band and the way that Tosin Abasi approaches his guitar technique. Incredibly inspiring and mind melting stuff. Any advice for newbies to 2000 Trees / festivals / camping in general? Hana of Camp Reuben: Leave it just like you found it. Introduce yourself to your neighbours. Don’t be a douche if you can help it. Hand in lost property. Sing loudly at the bands. High five the organisers and ANYONE who is working to make your time amazing. That includes stewards and toilet people – it wouldn’t be the same without them! Josh of Camp Turner: I believe the Xtra Mile festival starter list covers everything essential. My main advice would be to just relax and open yourself to new friendships and new music. Go for an explore, there are always secret sets scattered about and people with similar music tastes to yourself. Who knows what you might find!? Elly and Nardia of Camp Turner: For Trees, we would suggest getting there early. The atmosphere in the queue is a lot of fun, and you want to get in early to get a good spot and let the fun begin. I (Nardia) swear by boxed wine as a practical solution to your hydration needs! Dan of Camp Marwood: If you’ve not been to 2000trees before then the best advice I can give is to wander around after the “main bands” have finished. There’s loads of great busking stops and secret sessions going on until the early hours of the morning and you’ll get the chance to hear some damn fine music played by some damn fine people. Anything else you’d like XMR fans to know about your camp? Hana of Camp Reuben: We have a Facebook page and a YouTube channel where you can keep up to date with what we’re up to, have a say in what we’re trying to do and catch up on what you saw after the festival. We welcome people’s chatter and photos/videos to add to those we already have from resident photographer Hana (me!) – there might be something you saw that we didn’t! Josh of Camp Turner: Just that we’re a friendly community and welcome everyone. We don’t care if you’re a fan of Franks or not, if you love music and love meeting some weird and wonderful folk, come and have a visit! Elly and Nardia of Camp Turner: To get an idea of what Camp Turner is like, here’s a video of Rob Lynch playing our camp last year! 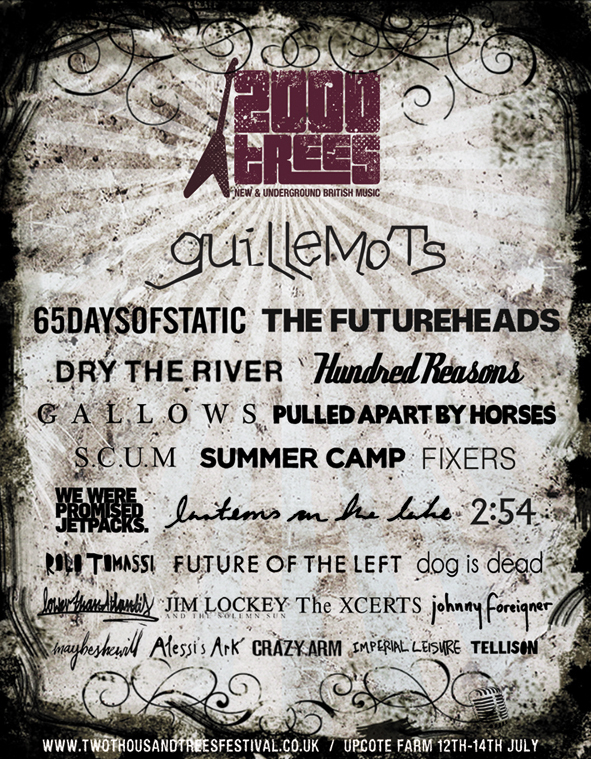 HUNDRED REASONS AT 2000TREES!! TICKETS NEARLY SOLD OUT!! Hope this here email finds you well? We’ve got a load of things to tell you about today so we’ve written you a newsletter – it’s a bit like reading one of those newspaper thingys but without the boring phone hacking / economy / z-list celebrity nonsense that passes for news these days. So read on below for an update on how soon tickets are going to sell out, band news in the pipeline, how to get to the festival, camping in style (including how you can win yourself the use of a free yurt), the fancy dress theme and recent competition winners! TICKETS VERY NEARLY SOLD OUT! Here at Trees Towers we’ve already started placing bets on when tickets are going to sell out! There’s only a few hundred left, so it really is just a matter of time till they’re all gone. So if you want a ticket – get yours ASAP or when you next get paid cause it might be your last chance – and will be so much more fun than paying your electricity bill! Don’t say we didn’t warn you! You voted overwhelmingly for VIDEO GAME CHARACTERS. So get your thinking caps on… there are FREE tickets for the best dressed and we’ll no doubt throw in some beer and merch as well. Congrats to Jen Lines & Dan Cox who jointly won the “horns / wristband” photo competition. You’ve both bagged a £50 bar tab at the fest this year for the following photos. The bar monkey will be in touch shortly with details on how to claim your beverages! BIG GREEN COACH IT TO THE FEST! Big Green Coach will once again be providing a shuttle service between Cheltenham Spa railway station and the 2000trees site (priced at less than a return taxi journey). Coaches operate every hour on Thursday 12th, Friday 13th and Sunday 15th July. There will also be a direct coach service from London Victoria on the Thursday and Friday. So why not leave your car at home, sit back, relax and let Big Green Coach bring you to 2000trees? Cheaper advance fares are available online now and you will also get priority boarding on the day! For more details and bookings please visit the BGC website. SHARE YOUR CAR AND MAKE NEW FRIENDS! Why not car share to 2000trees? It’s a great way to save money if you’re driving and as it’s built around Facebook, you can see if your mates are going, find people with similar music tastes and check people out before agreeing to share. Plus it’s a fun way to travel and meet new folks! So if you’re driving, or need a lift, go to GoCarShare and share the fun! This year we’ve signed up the good people at Karma Canvas to cater for all your luxury camping needs. To celebrate they’re giving away the use of a FREE Karma Canvas bell tent at 2000trees for two lucky people. Simply email your name to info@twothousandtreesfestival.co.uk before next Friday 4th May with the subject line “BELL TENT ME AT 2000TREES” and we’ll pick a lucky winner! If you fancy finding out more, then go to the Karma Canvas events page and enter your details for booking information. As you’ve probably heard we’ve got an awesome band signed up who we’ve wanted to book for years. All will be revealed in the next lineup announcement on Monday 7th May! If we don’t see you before, we’ll see you in 73 days! You’ll be pleased to know that our tame band monkey has been busy trying to book you the very best bands the UK has to offer. We’re super stoked to let you know that we have the fantastic Guillemots closing the festival on the Saturday night! Whoop whoop – we’ve wanted to book these guys for ages! Guillemots, The Futureheads, Summer Camp, SCUM, Three Trapped Tigers, Sonic Boom Six, Lucy Rose, Fixers, Brother & Bones, Gunning for Tamar, The Social Club, Fitz, Spirit of John, Luke Sital-Singh, Joby Hardwick, Richard Clarke and Aspen Sails. Head on over to our line up page to see where and when all the acts are playing. If you want to have a listen just click on the band’s name. We should probably also tell you that Trees is the only UK festival where The Futureheads will be playing TWO sets – a full band one on the Main Stage and Acapella in the Leaf Lounge. You lucky people! We’re already placing bets at Trees HQ as to when we’re gonna sell out. So if you’re one of the few who still hasn’t got your weekend ticket, we recommend you buy yours now! You can still get tickets here but not for long! Dry the River, Future of the Left, Lower Than Atlantis, Lanterns on the Lake, 2:54, Jim Lockey & the Solemn Sun, Maybeshewill, Alessi’s Ark, Arcane Roots and LOADS more (we got lazy so haven’t written out the full list!). Head over to our line up page to see where and when all the acts are playing – and if you want to have a listen just click on the band’s name. As always, let us know what you think on Bookface and Twatter. And get yo tickets here!